It is now widely recognised that professional presentation skills are an indispensable cornerstone of a successful scientific career. 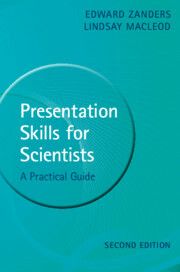 This updated second edition provides a concise and accessible guide to preparing and delivering scientific presentations. Its highly practical 'how-to' style focuses on the issues that are of immediate concern to the busy scientist. The text covers all of the important aspects of scientific presentations, including knowing your audience, producing visual material, controlling nerves and handling questions. It also includes advice on presenting in English for non-native speakers, helping them to improve the clarity and effectiveness of their presentations. Links are included throughout the text to the accompanying website, which contains annotated video clips of speakers delivering a talk and demonstrates the common problems encountered, as well as exercises designed to overcome them. It also contains image files to demonstrate the design issues to consider when creating visual material. 9. How did it go?